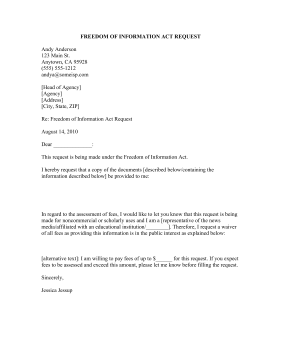 This Freedom of Information Act request can be customized for requests of records by any individual, member of the media, or academic pursuits. This request is being made under the Freedom of Information Act. [alternative text]: I am willing to pay fees of up to $______ for this request. If you expect fees to be assessed and exceed this amount, please let me know before filling the request.